Scott (1771-1832) was the author of immensely popular historical novels and poetry. Their combination of history, chivalry and romance was especially beloved by readers of the Victorian era. ‘The Lady of the Lake’ (1810) was the third of his epic narrative poems inspired by the landscape and legends of Scotland, and is set in and around the beautiful mountains, glens, lakes and forests of Perthshire and Stirling in central Scotland. 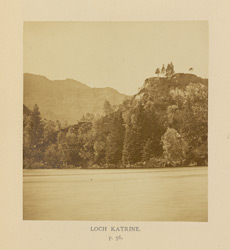 The great success of the poem made Loch Katrine and the Trossachs a fashionable destination for 19th-century sightseers.